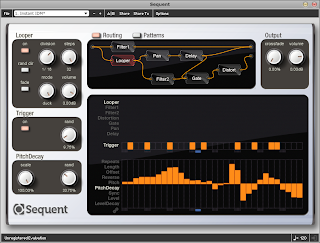 Sequent is a modular multi-effects unit, the perfect tool for mangling audio on stage or in the studio. The effects - including a flexible beat looper and a pair of filters capable of self oscillation - can be connected in practically limitless combinations by simply dragging virtual cables between them. Each effect parameter can be sequenced with a step sequencer (or which there are twenty-two), controlled live via a midi controller, or even left to chance by using the random mode. Sequences are combined into patterns which can be switched instantly between using either the on-screen interface or the notes on a midi keyboard. 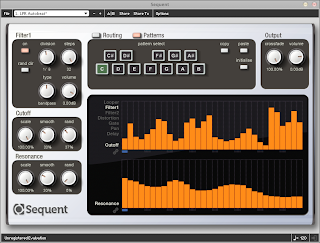 Sequent will shortly be available to purchase at the Loomer website for £49 GBP, for Mac OS X (Audio Unit, VST, RTAS and Standalone), Windows (VST, RTAS, and Standalone), and Linux (VST and Standalone). An free evaluation version will be available for download at launch. Hear Sequent in action with this short demo of an Amen loop being mangled.